Chain-link fences are renowned for their durability and resilient, low-maintenance nature. However, low maintenance doesn’t mean no maintenance. Even the most resistant fencing requires proper care in order to maximize its lifespan and effectiveness, so it’s important to make sure your chain-link fence gets proper maintenance. Fortunately, maintaining a chain-link fence is not a particularly labour-intensive task and is more a matter of prudence than anything else. Here are some quick tips to make maintaining your chain link fence a snap. Taking some time to go over and inspect your chain-link fence on a regular basis is an important part of preventative maintenance. Inspections don’t need to be too common—once every month or two or after major weather events is a good standard to keep. When checking over the fence, you have two main objectives. The first is to make sure that none of the links themselves are broken or missing. The second is to check the support posts. 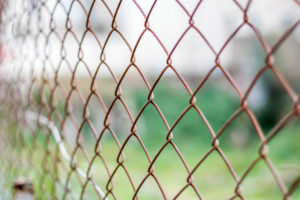 A large part of maintaining a chain-link fence involves the support posts since these parts are often metal and are more susceptible to rust. Along with rust and general wear and tear, the posts should be checked to ensure they are still secure within the ground. When upright, a support post should form a right-angle (“L” shape) with the ground. The appearance of rust on your chain-link fence can be problematic, but it’s fixable. If the rust spot is small, simple brand-name products like Rustoleum can be used to quickly resolve the situation. For larger patches, a slightly more involved process will be required. Apply a rust-inhibiting agent along with a metal primer and fresh coat of aluminum paint in order to cover up the spot and help mend the damage. In the extremely rare case where the rust defies even this method, replacement of the fence section will be required. Over time, dirt and debris will inevitably collect along your fencing and will need to be cleaned. In most cases, a power washer or garden hose will be enough to blast away any built-up dirt and debris and can serve most maintenance needs. Should the dirt be more caked-on, the good ol’ bucket of soapy water can be employed instead. If your fence is in a garden or near plants in general, you may wish to try a Borax solution in order to prevent soapy runoff from damaging the foliage. A white vinegar solution can help kill off any mould you find as well. The gate for your chain-link fence needs maintaining just as much as the rest of the structure. During your inspection, make sure to check the gate’s alignment since this can shift over time with use—especially if it is open and shut forcefully for a long period of time. If the gate seems to be out of alignment, use a socket wrench to loosen, reposition, and retighten the hinge pins. Be sure to double-check the swing of the gate before retightening. Total Fence Inc. has the knowledge, expertise, and talented fencing contractors to help you design, install, repair, and care for and any chain-link addition to your home or business. Contact us at 416-239-5362 to speak with a consultant and learn more.